Finding a permanent loving home for a baby approved for adoption can take several months. In 2012, the government said it would change the law to allow potential adopters to foster a baby while the courts were deciding on its future. So what has the Foster to Adopt experience been like for those taking this route? 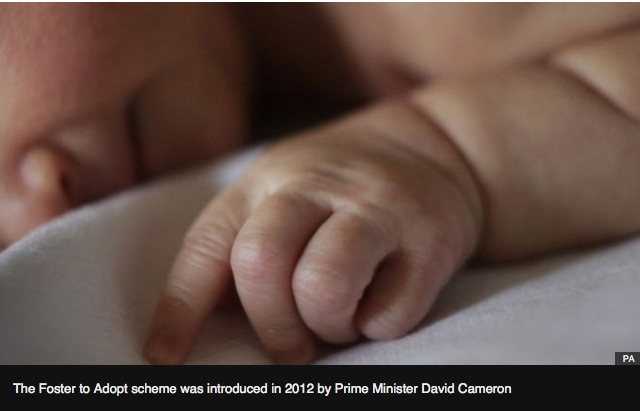 In 2013 David and Jane, from Somerset, were placed with a three-week old baby boy. “We met him on my birthday which was the best birthday because we’d gone through IVF and had miscarriages so that’s why we were doing this,” Jane says. Another couple, Mary and her husband John, volunteered to try out the scheme in 2013. They met their adoptive daughter when she was three months old. “A lot of the professionals we come in contact with comment how happy and sociable, how well adjusted she is,” says Mary. Those in favour of the foster to adopt scheme believe it increases the likelihood of an adopted child receiving a stable upbringing.